Cucullia montanae Grote, 1882, Canad. Ent., 14:175. 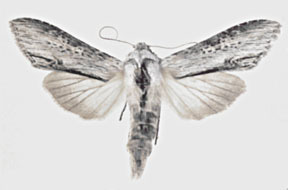 Cucullia montana Hampson, 1906, Catalogue of the Lepidoptera Phalaenae in the British Museum, 6:63. NOTE An unjustified emendation of montanae Grote and therefore an available name with the same type and type locality as montanae. Diagnosis: Cucullia montanae is a distinctive species superficially closest to similaris and asteroides. The forewings of similaris are bluish gray and lack the brown tints of montanae. 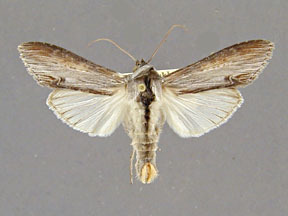 The forewing of asteroides has a far more suffused coloration than montanae and the costa above the reniform and orbicular marks is not distinctly black as in montanae. 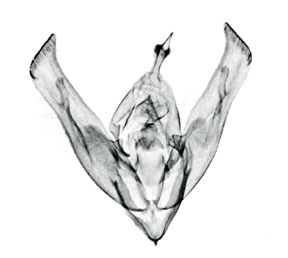 The clasper of the male genitalia is larger than in similaris and the band at the base of the vesica of the aedoeagus is diffuse, not dark and strap like as in similaris. The vesica is more highly modified than in other North American species of the group. There are always two spines instead of one, a small spine on a small diverticulum and a large spine corresponding to the single spine in the other species of the group. 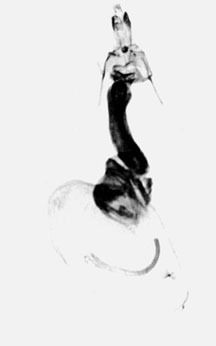 This large spine is borne on a single long diverticulum and the diverticulum does not have another projection as is found in such species as florea, postera, and similaris. The diverticulum bearing the small spine is the same as the small diverticulum found in asteroides, but in asteroides the diverticulum does not bear a spine. The diverticulum bearing the large spine is long in montanae, but globular and not elongate in asteroides. 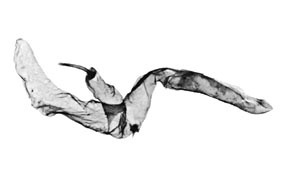 Wing length from base to apex: mean = 22.75 mm., standard deviation = 0.59 mm., n = 10. Distribution: This species is widely distributed throughout the western United States, often sympatrically with similaris. The scattered distributional data suggest montanae is most often found in dry localities at moderate elevations, often as high as 7,000 to 8,000 feet. 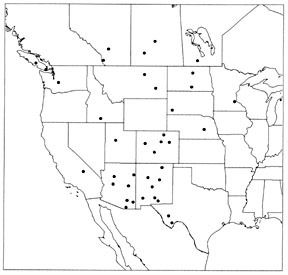 However, specimens have been collected as far east as Minnesota, North Dakota, and South Dakota, Cucullia montanae occurs in eastern Montana and western South Dakota, across into Alberta and British Columbia, down through the Rockies into Colorado and Utah. 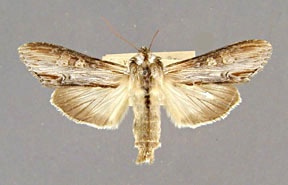 The species is also known from New Mexico, western Texas, and southern Arizona. Most adults have been collected in July and August. Larva: Crumb (1956) has described the larva. The larva is similar to asteroides. However the brown freckles of posterior margin of the head are distinctly darker than those on the remainder of the head. These freckles in asteroides are unicolorous over the entire head. The broad subdorsal band in montanae is dark filled only in the central one-half, but in asteroides the band is completely filled with dark color except at the anterior and posterior margins. Finally the spiracular lines are not filled with dark black in the region of the spiracle in montanae, but are in asteroides. Foodplants: Crumb collected his specimens from Grindelia (Gum Plant) (Asteraceae). Cook (1930) records the larva from Chrysothamnus (Rabbitbush) (Asteraceae). There is a reared specimen in the USNM from Wellington, British Columbia reared from Grindelia sp.